The candidates faced off for the first time as polls show the contest is neck and neck. WASHINGTON — In their first debate, Georgia Republican gubernatorial candidate Brian Kemp accused Democrat Stacey Abrams on Tuesday of encouraging undocumented immigrants to vote illegally, while Abrams charged her rival with mass purging voters, many of whom are African-Americans. Kemp, the secretary of state, encouraged viewers to Google comments Abrams made at a recent campaign rally in which she said the "blue wave" that Democrats are hoping for is made up of lots of different types of people, including "those who are documented and undocumented." Abrams, who is seeking to become the state's first black and female governor, quickly clarified after the event that she was not encouraging anyone to vote illegally, but Kemp seized on the comments in the hour-long debate in a contest that polls show is neck and neck. "Why are you encouraging people to break the law in this election?" Kemp asked. "She knows that's criminal." Abrams strongly denied the charge, noting that she is an expert on the state's election laws because she worked to expand voting access for years as a state lawmaker. Instead, she turned the attack back on her opponent, ticking through a number of scandals that have hit the secretary of state's office since Kemp took over in 2011. 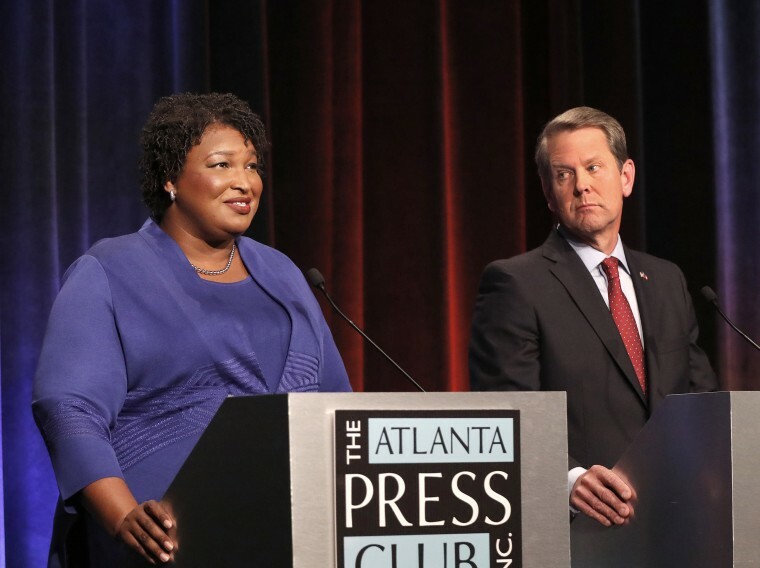 Abrams has attacked Kemp for purging tens of thousands of voters, most of whom are black, from the rolls ahead of the Nov. 6 election, accusing him at the debate of creating "an atmosphere of fear" around casting a ballot in the state. "They have been purged, they have been suppressed, they have been scared," Abrams said. Kemp denied the accusation, saying, "this farce about voter suppression ... is absolutely not true." He noted that registration, turnout and minority participation in Georgia elections have all gone up in recent years. "No one is being denied the right to vote," Kemp said. At issue is Kemp's enforcement of a rule known as "exact match," which requires names on voting rolls to precisely match names in other state records. But of the 53,000 voters recently purged through the process, 70 percent are African-Americans, according to an Associated Press analysis, an outcome that advocates say shows Kemp is trying to limit the voting power of the heavily Democratic demographic. Abrams also responded to a new revelation that, as a college freshman in 1992, she participated in a protest burning of the state's old flag, which prominently featured the Confederate Battle Flag after a 1956 redesign. The governor at the time was pushing to eliminate the flag, Abrams noted, and Kemp himself later voted to change it. "I'm a very proud Georgian," she said, explaining that she was "deeply disturbed by the racial divisiveness" of the Confederate-themed flag. The governor's race has become one of the most contentious and closely watched in the nation as Abrams battles a conservative in mold of President Donald Trump. Abrams, the former minority leader of the Georgia State House of Representatives, is staking her campaign on an untested strategy of turning out thousands of young people and people of color who do not typically vote in midterms. If neither candidate gets more than 50 percent of the vote on election day — a Libertarian candidate will also be on the ballot — the top two finishers, virtually certain to be Kemp and Abrams, will head to a runoff election on Dec. 4.